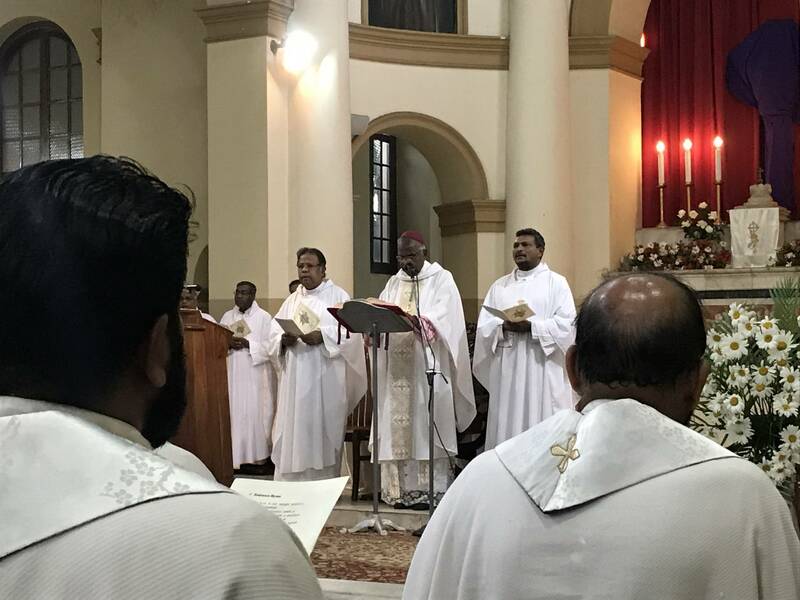 My dear Fathers, Once again we wish to congratulate our newly ordained Auxiliary Bishop of Colombo, Rt. Rev. Dr. J.D. Anthony. We wish him a very fruitful and joyful Episcopal ministry. This month another historic event will take place when Archbishop Emeritus Oswald Gomis will celebrate the Golden Jubilee of Episcopate on the 23rd of July. On the 20th of July there will be a felicitation ceremony to Archbishop Oswald Gomis at the Auditorium of Archbishop’s House in Colombo and the Golden Jubilee Mass will be on the 23rd at 5. 00 pm at All Saints Church, Borella. Along with the Clergy, Religious and faithful I wish to offer my heartfelt congratulations and prayerful wishes to Archbishop Oswald Gomis on this singular occasion as very few Bishops would have the privilege of celebrating the Golden Jubilee of their Episcopal Ordination. All of us are aware of the contribution he has made to the Church in Sri Lanka as an expert in Church History and also for the services rendered during his tenure of office as the Secretary General of the Episcopal Conference in our country. In particular, it was his vision, dream and determination that enabled us to have the present spacious Secretariat , Lankarama, Secretariat of the Catholic Bishops’ Conference of Sri Lanka. He has been and continues to be a prolific writer, and has authored many valuable works such as the “Mahopadeshaya”,(Catechism for adults) and many children’s Bibles. His service also to the Asian Church, both as the Secretary General, of the Federation of Asian Bishops’ Conference ,as well as the Chairman of the office of Social Communication, are well known. We offer our heartfelt congratulations and felicitations so to His Grace Archbishop Oswald Gomis on this happy occasion. Our congratulations and prayerful wishes also to our own brother in the Priesthood, Fr. 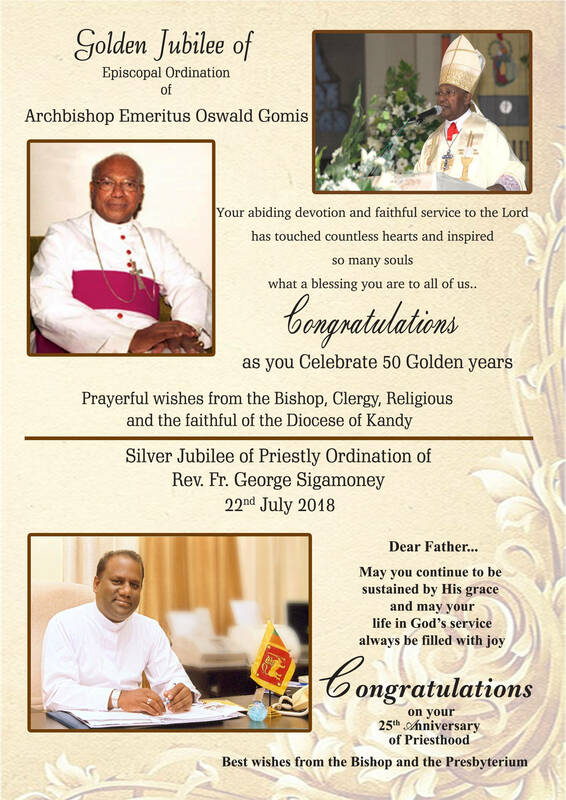 George Sigamoney as he chalks up 25 years in the Priesthood in the month of July. 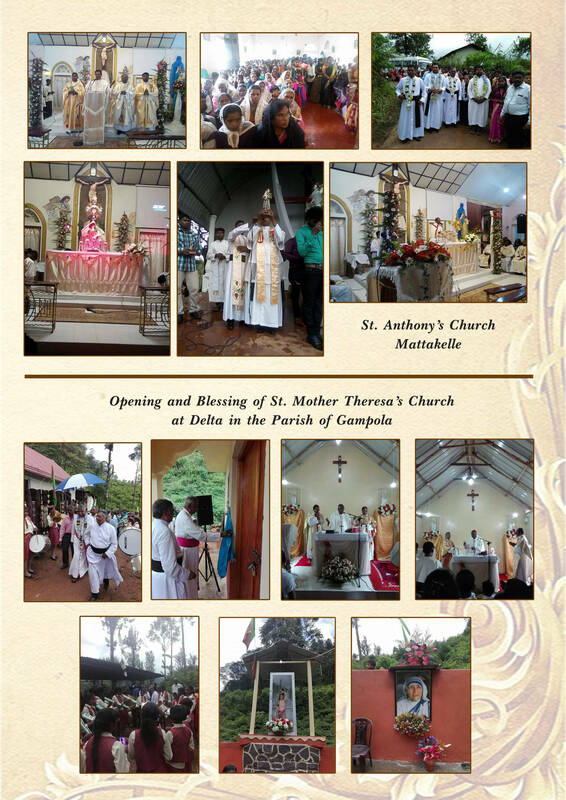 He will have a Thanksgiving Mass in his home parish , Nuwara Eliya and the Presbyterium will also celebrate the occasion with a Thanksgiving Holy Mass, as customary, at our July monthly Recollection. In the Month of July we shall also observe the Indigenous Clergy Sunday on the theme “Call to discipleship through Saintly life” . 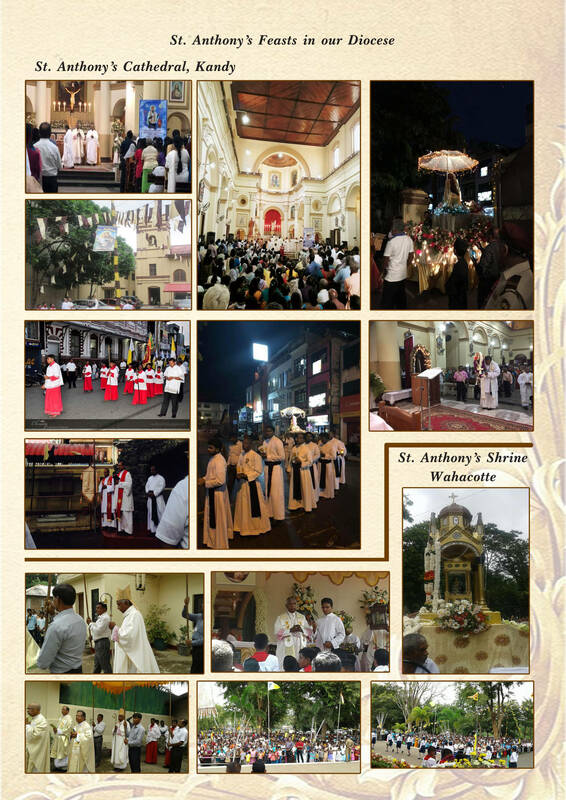 It will be held on the 29th of this month in all the dioceses. 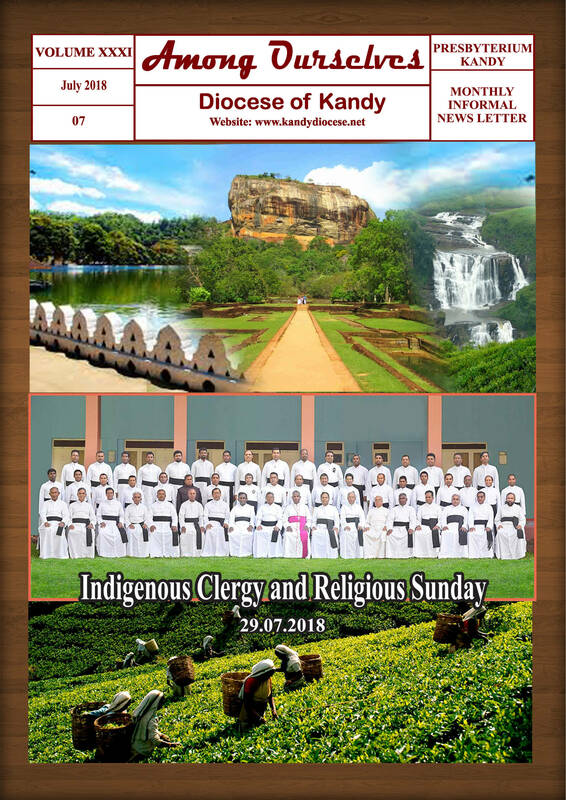 Please announce the same on the previous Sunday and organize animation programmes, on the need to promote vocations to the Priesthood and Religious Life, as well as to encourage our faithful to contribute generously towards the formation of Indigenous Clergy. 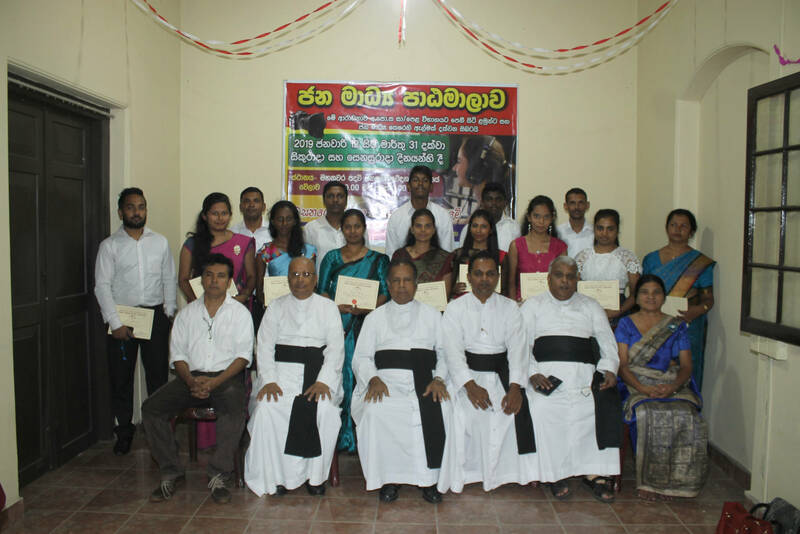 We also had the Kandy Vicariate lay animation programme on the theme “You are my witness” at Ampitiya on the 27th of June. I wish to thank all the parish priests who enthusiastically sent their lay representatives for this programme. In the month of July we shall have the second programme in the parish of Hatton. Please make sure that you send your lay leaders for these programmes. I am grateful to the committee ,led by the coordinator Fr. Sudath Perera for this great contribution to forming our lay-leaders. The seminarians will begin their major vacation on the 15th of this month. I solicit your kind collaboration in their pastoral and spiritual formation during their time with us in the diocese as they are sent to various parishes and institutions. Wishing all of you God’s blessings. • Live according to his moral code Grow in his gift of divine life The seven sacrements are a fundamental part of the Catholic faith. Freely choosing to accept grace When God made us, he gave us free will. He continues to respect our free will to the end. When Jesus died upon the Cross to redeem us from our sins, it did not mean that from then on everyone would have to go to Heaven whether they wanted to or not. When Jesus died upon the Cross, he paid an infinite price for an inexhaustible flow of grace. That grace would enable each person to turn back to God and to remain united with God through this life and through eternity. That brings us to a question: How would Jesus provide for this flow of grace to individual souls? • Would the whole thing be invisible? Outward signs… The outward signs are God’s way of treating us like the human beings we are. He conveys His unseen grace into our spiritual souls through material symbols which our physical bodies can perceive—things and words and gestures. The outward signs of the sacraments have two parts: the “thing” itself which is used (water, oil, etc. ), and the words or gestures which give significance to what is being done. …Instituted by Christ… We know that no human power could attach an inward grace to an outward sign—not even the divinely guided but humanly applied power of the Church. Only God can do that. Which brings us to the second element in the definition of a sacrament: “instituted by Christ.” Between the time He began His public life and the time He ascended into heaven, Jesus fashioned the seven sacraments. When He ascended into heaven, that put an end to the making of sacraments. The Church cannot institute new sacraments. There never can be more or less than seven, the seven Jesus has given us: Baptism, Confirmation, Holy Eucharist, Reconciliation (Confession or Penance), Anointing of the Sick, Holy Orders, and Matrimony. Jesus did completely specify the matter and form of some of the sacraments—notably Baptism and the Holy Eucharist. But this does not mean that He necessarily fixed the matter and form of all the sacraments down to the last detail. Concerning some of the sacraments (Confirmation, for example) He probably left it to His Church, the keeper and the giver of His sacraments, to specify in detail the broad matter and form assigned by Christ. …To give grace Coming now to the third element in the definition of a sacrament, we have its essential purpose: “to give grace.” What kind of grace do the sacraments give? First and most important of all, they give sanctifying grace. Sanctifying grace is that marvelous supernatural life, that sharing-in-God’s-own-life that is the result of God’s Love, the Holy Spirit, indwelling in the soul. • He have the intention of administering the sacrament (the intention of doing what the Catholic Church intends) He perform the essential ceremonies of the sacrament (such as the pouring of the water and the saying of the words in Baptism). If you assume a receiver who does not put any obstacles to grace and a giver who is qualified to administer the sacrament—then always and infallibly a sacrament will confer grace. Special “marks” on the soul Besides the bestowal of grace (sanctifying and sacramental) we should mention another effect specific to three of the sacraments. This is the character imprinted on the soul by the sacraments of Baptism, Confirmation, and Holy Orders. We sometimes say that in these sacraments God puts a “mark” on the soul. The individual mark imparted by Baptism, Confirmation, and Holy Orders is defined by theologians as a “quality” which imparts to the soul powers which it did not previously possess. It is a permanent quality of the soul, an alteration in the soul which forever will be visible to God, the angels, and the saints. • The character of Baptism is a supernatural quality which gives us the power to absorb the grace of the other six sacraments and to participate in the Mass. • The character of Confirmation gives us the power to profess the faith fearlessly and to spread the faith. The character of Holy Orders gives the priest the power to celebrate Mass and to administer the other sacraments. The extraordinary through the ordinary The Catholic sacraments are quite extraordinary: they are ordinary signs that do God’s own work. God in His wisdom chose to bestow His grace in a visible way to give us the quieting certainty that we had received grace when He did give it. Christ has given us so many tremendous gifts. In his sacraments, he continues to provide those gifts to us, beyond all measure, whenever we need them. The Priest, who experience fatigue and loneliness in their pastoral; work , may find help and comfort in their intimacy with the Lord and in their friendship with their brother priests. A “witness” is someone who attests to a fact, so in order to be an effective witness for Christ, one must have firsthand knowledge of Him. John the Apostle speaks of this in 1 John 1:1-3, when he says, “That . . . which we have seen with our eyes, which we have looked at, and our hands have touched—this we proclaim concerning the Word of Life.” Today, we who have experienced new life in Christ give an account of His love and forgiveness, both verbally and in the way we live our lives. This is witnessing. To be effective in our witness, we should remember several basic things: 1) the THEME of our witness is Jesus Christ. Paul defined the gospel as the death, burial, and resurrection of Jesus Christ (1 Corinthians 15:1-4). If we aren’t explaining the sacrifice of Christ, then we’re not really sharing the gospel. (See also 1 Corinthians 2:2 and Romans 10:9-10.) An important part of this theme is the fact that Jesus Christ is the only way to salvation, not just one of many ways. “I am the way, the truth and the life. No one comes to the Father except through me” (John14:6). 2) the POWER of our witness is the Holy Spirit. It is the Spirit who transforms a life (Titus 3:5), and a transformed life is evident to all. As we witness, we should spend much time in prayer, appropriating the Spirit’s power so that we are enabled to let our light shine in such a way that others will recognize the power of God in us (Matthew5:16). 3) the VALIDITY of our witness will be shown in how we live our lives. Philippians 2:15 sets this goal for us: “That ye may be blameless and harmless, the sons of God, without rebuke, in the midst of a crooked and perverse nation, among whom ye shine as lights in the world.” The effective Christian witness will live his/her life above reproach in the power of the Holy Spirit, whose fruit we exhibit when we remain in Christ (John 15:1-8; Galatians 5:22-23). Perhaps most importantly, we must be familiar enough with the Scriptures to be able to accurately and coherently present the gospel to others. “Always be prepared to give an answer to everyone who asks you to give the reason for the hope that you have” (1 Peter 3:15). Always being prepared means diligent Bible study, memorizing Scripture, and praying for God-given opportunities to share with those whose hearts have been prepared by the Lord to hear His message of salvation. Continuation of the last issue Most Recognizable and Divine Catholic Symbols and Their Meanings For the common man, it is through these symbols that they can base their understanding of complex religious philosophies. In the spiritual realm, these objects, signs, and symbols take on the role of acting like a badge of faith as well as a teaching tool. You can even call these objects as the means to distinguish and identify one religion from the other. Symbolism may be defined as the investment of outward things or actions for the expression of religious ideas. While the cross, crucifix, and the rosary are well-known symbols used to identify followers of Christ, the Catholic Church has many more symbols and objects that sets them apart. These symbols are a vital part of the Catholic religion, and needless to say, each has its own deep significance. 12. While the Lion of Judah referred to Judah, the fourth son of Jacob in the Old Testament, the Book of Revelation uses it to refer to Jesus. Both Jesus and King David hail from the tribe of Judah, making the lion a representation of the triumph of Jesus. 13. The Paschal candle lit every year at the dawn of Easter is symbolic of the risen Christ. The flame of the candle is used to symbolize the eternal presence of Christ who is also called the light of the world. 14. Bread that is used as a symbol of sacrifice is made from wheat. Just like the grain of wheat that falls to the ground and dies so as to bear fruit, so is the life of Christ a sacrifice. This just goes to say that the grain of wheat is a symbol of Christ. 15.The Sacred Heart is depicted as a heart with a cross pierced through it and thorns twisted around the heart. It is a symbol of Christ’s eternal love for all humanity. 16, A symbol of God’s grace and peace, a dove is used to represent the Holy Spirit. The Paraclete or the Holy Spirit forms the third person of the Trinity. 17. The Rosary beads are used as a means to keep a count of the number of Hail Mary’s while contemplating on the episodes, also called the mysteries in the life and death of Jesus. It is the Catholic way of praying to Jesus by interceding through Mary. The Rosary prayer itself is akin to a Crown of Roses, or a garland of rose, laying emphasis on the life of Mary whose focus was Christ. 18.The Fleur-de-lis is a stylized lily that is used to decorate shrines, chapels, and grottos dedicated to Mary. It is used to symbolize the purity of Mary. 19. Considered to be a symbol of humility, chastity, innocence, and purity, the lily is often used to symbolize Mary. The white lily, in particular, is a flower of great beauty and when open, resembles a star and is likened to Mary. 20. Mary’s heart is depicted as pierced with seven wounds or swords, and has roses or flowers wrapped around the heart. This image is one of the most popular images of the Immaculate Heart, attracting the attention towards the love and virtues of the heart of Mary. 21. Crossed keys are symbols of the Pope’s authority. St. Peter who was considered to be the first Pope was promised the key to the kingdom of Heaven. A representation of the triple tiara combined with two crossed keys of Saint Peter continues to be used as a symbol of the papacy and appears on papal documents, buildings, and insignia. 22. The triple cross, or the cross with three horizontal beams, is used as an emblem for the office of the Pope. One of the interpretations of the three crossbars, akin to the three bands of the tiara, is interpreted as teacher, lawmaker, and judge 23. The Patriarchal cross or the archiepiscopal cross is seen on the coat of arms. Unlike the cross of the Pope, this has two horizontal bars signifying the archbishop. TUESDAY THE 24TH JULY TO THURSDAY THE 26TH JULY, 2018 The target group for this year will be the Diocesan Priests & Religious ordained in the: YEARS 2014 & 2015 Hope you have kept the dates free. We are looking forward to your participation. The Inaugural Mass of the Pontificate for Pope Francis took place on the Solemnity of St. Joseph, March 19th. Pope Francis explained why St. Joseph is one of his most beloved saints during his trip to the Philippines: “I have great love for St. Joseph, because he is a man of silence and strength. On my table I have an image of Saint Joseph sleeping. Even when he is asleep, he is taking care of the Church!” Pope Francis advised people to leave a “note” under the image of the saint for help whenever they have a problem. This replica of that statue from Fontanini is made of polymer and measures 6 1/2″L.